June 5, 2015 | Meagan Miller & filed under Training. If you’re a CJSR producer who wants to build up your skills hosting a call-in show, we’ve got a workshop for you. On Friday June 26, we’ll be hosting a free workshop with Terri Campbell, producer of CBC Radio One’s Alberta-wide call-in show alberta@noon. Every weekday, the show brings on interviewees and takes calls from around the province on everything from politics to gardening. You might know alberta@noon as the show where former Premier Jim Prentice uttered his infamous comment that Albertans should “look in the mirror” for the source of the province’s financial woes. Now it’s your turn to learn from Terri Campbell how to host an engaging show, and create an atmosphere on air that’ll have listeners clambering over their friends and relatives to call in and share their views. 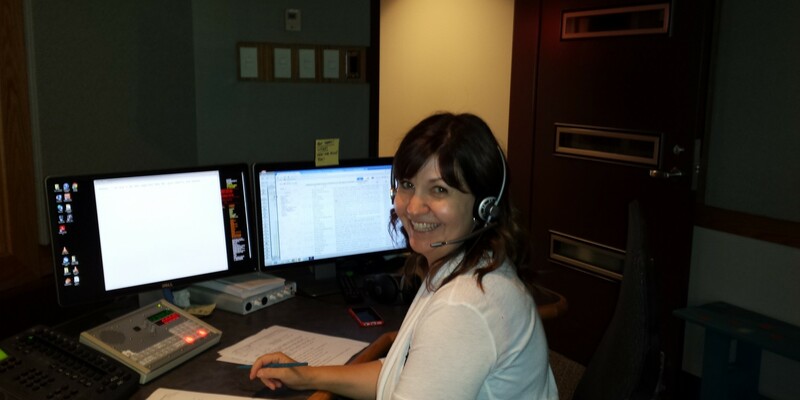 Terri Campbell is the producer/studio director for alberta@noon, the provincial noon show on CBC Radio One. alberta@noon is where Albertans can connect, talk to news makers, and voice their opinions on stories that matter. Terri has worked at CBC Calgary for 25 years as a TV anchor and reporter, radio news reader and reporter, former host of the weekend radio show “Daybreak Alberta”, and has been the producer of alberta@noon for the past 6 years. Terri is from the small town of Ogema, Sask and is a graduate of the University of Regina’s School of Journalism and Communications. Prior to coming to Calgary, she worked at CKSA Radio/Television in Lloydminster, CTV Regina, and was one of the original employees when STV (now Global) launched in Regina.